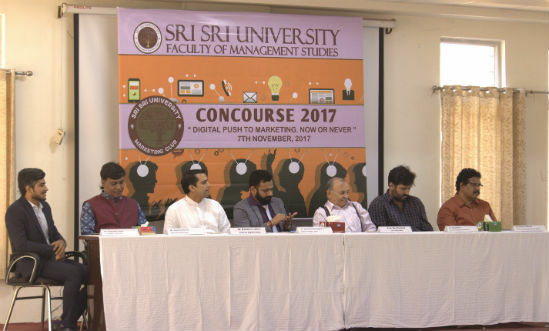 Cuttack: Sri Sri University organized and hosted 4th National Marketing conclave ‘Concourse 2017’ with the theme of “Digital push to Marketing. Now or Never” on Tuesday November 7, 2017 in the presence of expert marketing speakers around the digital world .As a guest Mr. Amar Krishna Jha, Digital Marketing Expert who spoke about how digital marketing helps nourishing a student’s career. We had Mr. Deepankar Lamba, alumni of Sri Sri University and the co-founder of Stellar Grid, emphasized on the importance of a relevant channel and a resonating message in the emerging world of digital marketing. 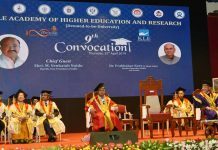 The former speaker, Mr. Nadir Mistry, General Manager of Bookmyshow, threw some light on the importance of data collection and interpretation for a more efficient marketing system. He also spoke about the key factor to a better customer relation, is to deliver the message as ‘he’ wants to hear and not as the company wants it to deliver. As a guest Mr. Anshuman Mahapatra, General Manager of Aircel, who speaks about marketing enthusiasts aware about the emerging sector of video campaigning in the digital marketing sector. A paper presentation competition organized for the marketing students to boost their enthusiasm. The winners of which were- …….. This conclave proved to be a grand success as the audience gained a great deal of digital marketing knowledge from the experienced speakers. This success wouldn’t have been possible without the efforts of Mr. Subhash Nath, Mr. Sandeep Janayavula and Mr. Pushpendra Khandelwal .